The Grand Canyon of the Colorado is probably the most famous section of river in the world, and truly the trip of a lifetime. This is the big one – A once in a lifetime epic; The Grand Canyon of the Colorado river is one of the world’s great wonders of nature. This 12 day, 200 mile epic will take you through varied rapids and breathtaking scenery, over a mile deep within the world’s most famous river canyon. A trip for paddlers and non-paddlers alike, this is the great american wilderness adventure to share with friends and family. 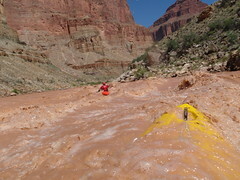 Our Grand Canyon trips run with full motorised raft support, meaning that non paddlers can enjoy the safety and comfort of raft, and kayakers can take a full compliment of camping gear whilst still keeping their kayak light and responsive. Day 1 Arrive in Las Vegas and head to centrally located hotel. Day 2 Leave Las Vegas for Canyon Rim. That afternoon we’ll meet with the rafting outfitter, pack our gear, outfit kayaks and enjoy a sunset dinner in the desert. Day 3-14 Paddle the Grand! We will take a maximum of 15 paddlers on each trip, although the number may well be less than this. With every 4 paddlers we have on the trip, we’ll have a highly experienced Teacher/Guide. 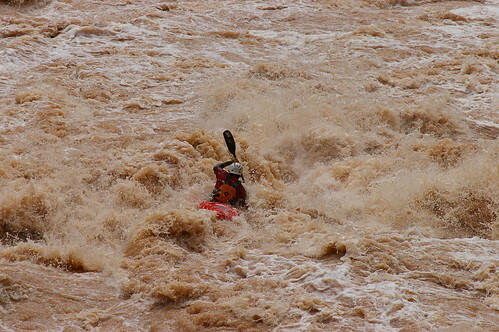 Grand Canyon Multi Day Adventure takes place on Class II/IV whitewater. The Grand Canyon Multi Day Adventure is suitable for experienced paddlers who are able to paddle for 3 – 4 hours in a day on Class II/III. The Colorado river is only accessible by road at a few points, and as such there is prolonged exposure to remote terrain. This trip begins on an easier whitewater, but will soon reflect conditions expected at the grade. Participants should therefore expect to be in a river environment for sometimes extended periods of time. * The Grand Canyon Multi Day meets in Las Vegas at our allotted hotel for 1900 on the Day of Arrival. An airport shuttles or a taxi ride are both, a short trip and straight forward from Las Vegas Airport to our centrally located hotel. ** Gene17 can source kayaks for hire from local suppliers, and may be able to arrange the purchase of a new boat at a US discount price. On late bookings, or requests for kayaks we can not source, please consider bringing your own boat.